Keep your legs and toes warm in this generously sized bohemian bed runner. Decorative trim is a luxurious finishing touch. 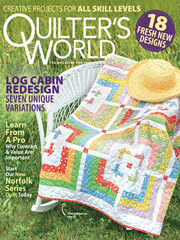 This e-pattern was originally published in the April 2011 issue of Quilter's World magazine. Size: 88" x 44", excluding fringe. Block Size: 10 1/4" x 10 1/4".